The modern picture of mathematical space was invented by Descartes and his contemporaries in the first half of the seventeenth century.The key idea is to represent each point in space by some numbers called “coordinates”, indicating the way you need to travel from some fixed origin to get to the point in question. It so happens that the number of coordinates you need is the dimension of the space. One of the advantages of this system is that it can represent all kinds of abstract “spaces”, not just the physical space of a piece of paper of the volume of space in a room, and we can do geometry in them. This has been used creatively in a variety of ways, including in one of the least likely media: sound and music. Musical notation already uses a two-dimensional system, as you might already know, with the horizontal dimension representing time and the vertical representing pitch. In fact in traditional notation this doesn’t quite work, but that’s roughly how it goes. Composer Iannis Xenakis wrote many pieces exploiting this.Before becoming a composer he was trained in mathematics and architecture. He brought both to bear on his practice, which was unlike anything else in music at the time. We’ll talk a bit about the way straight lines can combine to create curves in our course “Strange Spaces” after Christmas. (The main image for this post shows a preliminary sketch for the same piece — source). 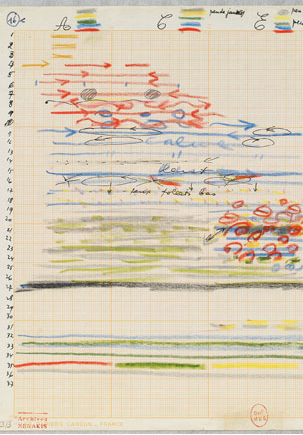 Xenakis’s Pithoprakta is, if anything, even more complicated. He was interested in the way apparently random individual behaviours can “add up” to something else when many individuals are combined, like the way clouds of gas move although its individual molecules are bouncing around randomly. In these pieces everything is carefully calculated using stochastic models that allow for randomness to be constrained in ways that allow him to produce the effects he’s after. (“Stochastic” sounds fancy, but it just refers to the mathematical study of systems that include some randomness). The role of mathematics here is conceptually important, and perhaps also developmentally; it’s not clear that Xenakis would have arrived at many of these sounds had he not used geometric and statistical tools to make them. Yet there’s no need for the audience to understand anything about these things to engage with the music. 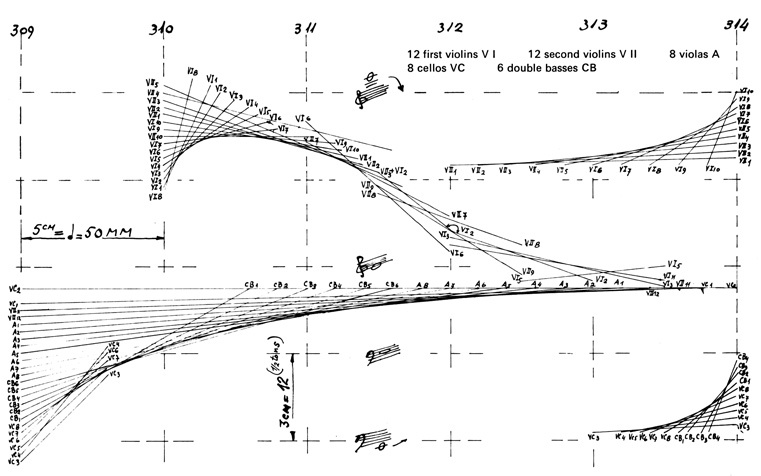 And the scores are important in themselves; after all, surely these are all visual works as well as auditory ones.